Which is the right toy for my dog? Which toys should I choose for my dog? GoughNuts are all about safety, and choosing the correct sized toy for your dog is part of the safety ethos. The toy should look oversized in the dogs mouth. Choosing a too small toy could be dangerous to your dog. If in any doubt, please choose the larger sized toy, or contact us for advise. Small GoughNuts are for toy dogs under 8kg in weight. 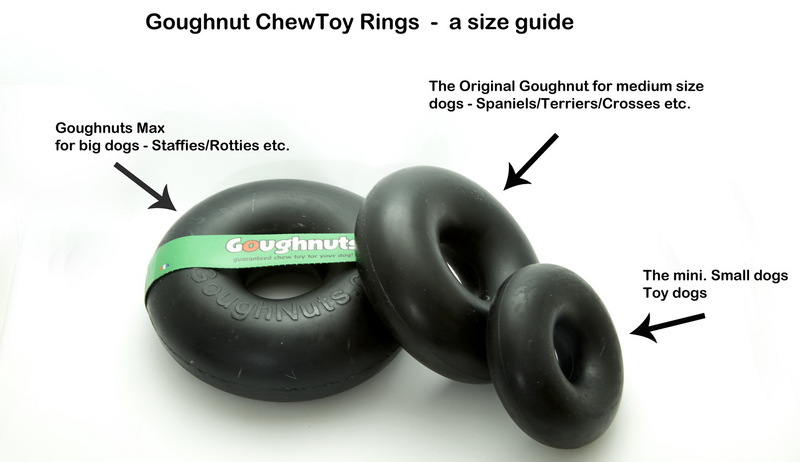 Original GoughNuts are sutiable for most average sized dogs from Jack Russell terriers to smaller Labradors. Maxx GoughNuts are for large and Giant dogs. Does my dog need a MaXX pro GoughNut? - The Pro range is generally for dogs that have chewed through more than 2-3 regular GoughNuts. If you think this what your dog needs, please contact us before buying one. 'Upgrades' are available if you want to change from a coloured toy to a black one, or a regular toy to a Pro 50 one. Please get in touch to do this. If you are in any doubt which size is the right one for your dog, please contact us.